Shower of Roses: Happy Birthday Holy Father! So, it turns out that my parents were married on the 50th Birthday of our dear Pope Benedict!! 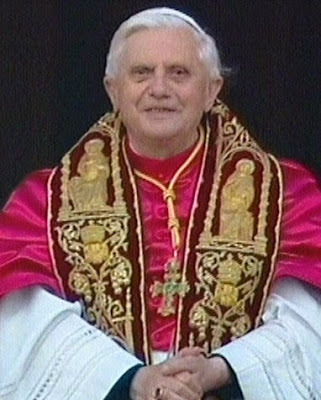 That would make today Pope Benedict XVI's 81st birthday! In honor of our Holy Father's birthday AND his visit to the United States!! We are spending the week watching lots of EWTN live online, as well as making a lapbook! We will continue later today after we return from town--Captain has another lesson with Mrs. K. There are just SO MANY ideas and links out there... (Our favorite has been this one.) Thank you everyone for sharing! OH! 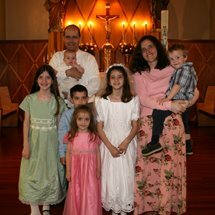 And don't forget to check out Catholic Cuisine, Amy just posted a great suggestion for a Birthday Dinner for Papa Ben! How fun!! Enjoy the day! It sounds like we are doing similar things today. Happy Anniversary to your parents. Have a wonderful day! Jessica....Thanks for making me feel better. However, reading your blog now for a couple of weeks you are so organized I really find it hard to believe. Thanks again. I really felt bad. It was my step-mother that I forgot. Aye indeed, we too will be watching our Holy Father this week. Tis a blessing to have our Faith.